Victoria Beckham’s idea for fall 2016 was to make the bustier appropriate for day She cut it in unexpected materials like Prince of Wales check with a bright waxed thread stitched through it and in thick, spongy houndstooth jacquards, both with cutouts sliced below the bustline. These fabrics aren’t necessarily designed to hug a woman’s curves, but she can also opt for the body-con ribbed knit pieces (solids and striped) that Beckham layered over each other to achieve a similarly curvy effect. To balance that, she also experimented with volume, sending out bubble skirts and others that flared generously to below the knee over flat shoes. 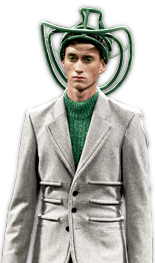 Outerwear was strong: Softly structured clutch coats with fringe detailing at the hem shared the runway with more sartorially, sharply tailored numbers in menswear checks.